Lady Marmalade Cafe opened just over a year ago in Stones Corner and is owned by Bec and Mal, the 'urban hippies' from a past Masterchef series that you may recall. With an obvious love for food, they have injected a fresh and funky corner cafe into the area, with offbeat decor that certainly stands out in contrast to the surrounding shops. We sat outside on a Friday morning for brunch. Our tables and chairs were decorated with images and newspaper articles, and were across the walkway from some smaller stools and freshly growing herbs. Inside had a rustic feel with splashes of colour, various magazines and a wooden bench top with high stools looking out the window - perfect for a quick read of the newspaper and a coffee on your lunch break. Lady Marmalade specialises in gourmet sandwiches and seemed to have an emphasis on all things local, organic and homemade – breads, soups, muffins, fresh juice and sweet treats. An inside cabinet offers a range of gluten free sweets as well as mini tarts, savoury tarts, quiche and a delicious looking couscous. There is also a range of cold juices and organic drinks. 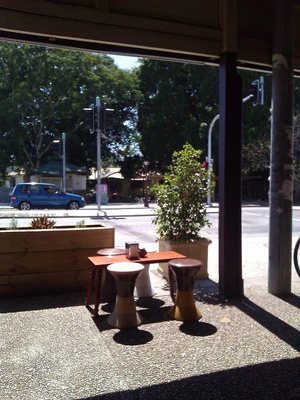 For the coffee connoisseurs, beans are a single source Brazilian variety and are roasted in Melbourne. For those who just want a decent coffee, Lady Marmalade lives up to the mark. I had an iced coffee with a dash of creamy ice cream – perfect for the sunny day it was – and my friend had a beautifully decorated flat white. The menu is small but offers a variety of combinations nonetheless. 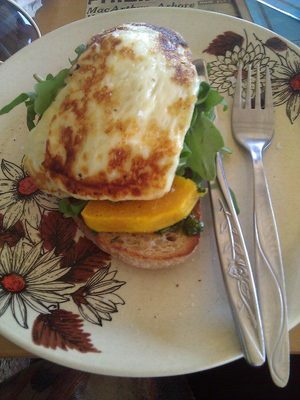 I enjoyed haloumi, roasted pumpkin, tomato and spinach on sourdough with chilli mint pesto while my friends had toasted gourmet sandwiches. Haloumi, roasted pumpkin, tomato and spinach on sourdough with chilli mint pesto. 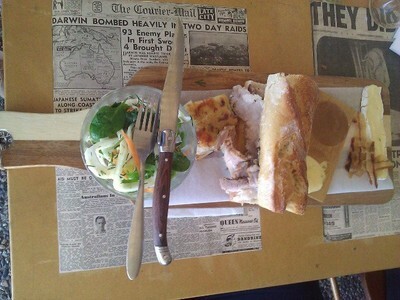 One friend had come along specifically to order the Friday special; a roast pork and brie cheese baguette. However, this was a lunch special and we had arrived a little before 1130, so we waited for the pork to be cooked. This meant that the pork was incredibly tender having just come out of the oven. It was accompanied by a small salad, apple sauce and crackling, and was beautifully presented on a long platter. My friend was very satisfied. Fresh pork and brie baguette special. Lady Marmalade is open for breakfast and lunch and also offers free wifi and catering. The facebook page is great to check out for comments and more images too. Why? Fresh food, funky atmosphere. Great review. I often hit the outlet stores at Stones Corner, and Lady Marmalade sounds like a place my mum and I would love to visit for a coffee and maybe some lunch after a taxing retail workout. St. Bernard's is at TAMBORINE, a good one hour drive from Brisbane.